I found some interesting information on the Organic Gardening Website regarding watering plants. This was just page one of several pages and caught my eye because I have had to do more watering than usual this year. Gardeners can't depend on Mother Nature to do all the watering all the time. That's why watering your garden wisely (and conserving moisture once it gets in the soil) is a fundamental skill that your crops will thank you for cultivating. How well your garden soil retains the water it receives depends on what type of soil you have. To keep things simple, we'll classify soils into three general types: sand, loam, and clay. Sandy soils have lots of air spaces between the particles. This allows for good drainage - sometimes too good. Water moves through sandy soil fast and the soil tends to dry out rapidly. Clay soils are just the opposite. They have almost no air spaces between particles and drain very poorly. Clay absorbs water slowly, but once wet holds lots of water (often too much). But no matter what type of soil you have, the key to keeping water in your garden is compost, compost, compost. Compost helps improve any soil by acting like a moisture-retaining wick. Every shovelful of that rich organic matter you add to the garden boosts your soil's ability to hold water. Keep in mind that you'll have to apply more, not less, water to a garden high in organic matter to wet the soil to the depth you want. But because the soil holds more water, your garden may be able to go longer between waterings. Routinely pinch off faded petunia blossoms to keep plants flowering. When deadheading roses cut faded blooms back to a healthy outside bud with five leaflets. Transplant oriental poppies when they’re dormant, usually sometime in July. The foliage will be brown and dry, but the plants are not dead. Get a group of friends together and order spring-flowering bulbs in bulk by midsummer. Buying in large quantities will significantly lower the price per bulb and let you enjoy more variety. Thin apple trees when the fruit is the size of a dime. Leave one apple per cluster, with apples spaced 8 – 12 inches apart. To keep mice out of orchards, where they can damage trees, make sure the grass is well mowed and the area cleared of debris and fallen branches. When you see tent caterpillars building their tents, pull the webby constructions down into buckets of soapy water. Work on a cool, rainy day, when the tents will be full. Trap flies and moths before they damage your fruit trees by mixing together 1 cup water, ¼ cup cider vinegar, ¼ cup sugar, and 1 tablespoon molasses. Pour it into small containers and hang one or two traps per tree. Clean and refill the traps every few days. and we can make a good batch of pickles. Native to Asia Minor and areas of the Mediterranean, most of the commercial dill today comes from India. It usually grows to about three feet tall with a single smooth, hollow stem with shiny white and green stripes. The leaves are finely divided into feathery leaflets, similar to fennel but darker green. Small yellow-green flowers are borne in large umbrella-like clusters up to six inches across. If you’ve grown dill before, you are probably finding seedlings around the area. They transplant poorly, so, if possible, let them stay where they grow and thin to about 18 inches apart. Sow again a couple of times in the summer if you want a continuous supply. paper bags until seeds drop. Store seeds in airtight containers. The best way to preserve the pleasant flavor of dill leaves is to freeze them immediately after harvesting. The flavor is just not the same when dried. Dill can be used to make delicious pickles, but good cooks add dill seeds and leaves to a wide range of dishes and recipes. Leaves can be sprinkled on salads, cooked vegetables, fish and sauces. One of my favorites is to put a layer of dill in the bottom of my fish steamer, put a good salmon on top of that and then add another layer of dill and a few lemon slices. Steam till done and then use the dill to decorate the serving platter. 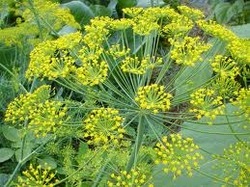 Mix a tablespoon of chopped dill in cream cheese or sour cream for a nice vegetable dip or cracker spread. Use the unripe seeds to flavor vinegar. Steep a seed head and part of the stem in one pint of vinegar and strain after a week or two. I love it in pickled green beans and carrots too. If you are fortunate enough to have salmon to can, try putting a few sprigs of dill in the top of the jar before you seal it up. When you open the jar in January, it will bring back the fragrances of July. Gather flowers early in the morning, when the plants are least stressed by heat. Use sharp scissors, for dull blades destroy the water-carrying cells. Get the flowers into a bucket of tepid water immediately. Cut herbs while the dew is still on them, on the morning of what promises to be a hot day. Herbs that have not yet flowered will be richest in essential oils. To dry herbs, strip the leaves from the stems and spread the leaves on wire mesh trays in the shade. Stir them once a day for 4 days, then pack into airtight containers. To have fresh herb flavor available for soups and sauces all year long, rinse fresh herbs, then puree them in a blender or food processor with a little water or broth. Freeze in ice cube trays, then store the frozen cubes in labeled plastic bags. 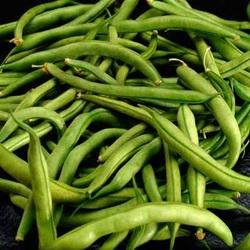 Pick beans every 2 or 3 days to encourage continued production. They’ll have the best flavor if you harvest them in the morning. Use two hands to pick peas. Hold the vine with one hand and pull off the pods with the other. After you finish harvesting a crop, pull up the plants compost them, and put something else in the garden. Lettuce, spinach, and Swiss chard are good late-season crops.